Barring significant changes in group voting habits, many commentators have argued that “The Coalition of the Ascendant” is positioned to give Democrats a notable edge in elections in the near future. There may be some truth to that supposition: The country is clearly getting more diverse, and nonwhite voters tend to vote strongly Democratic. A key cog in this coalition has been young voters — often called Millennials — who are more diverse than their elders. Exit poll data in 2012 suggest that young people were vital in securing President Barack Obama’s second term in the White House. He garnered 60% of the 18-to-29 vote (after winning 66% of it in 2008), by far the highest percentage Obama won among any age group. Estimating from exit poll data, all else equal, it’s possible that Obama would have narrowly lost the popular vote (and perhaps the Electoral College vote, too) had he won the same percentage among 18-to-29 year olds as he did among 30-to-44 year olds (52%). Continued strong support for Democratic presidential candidates in the future among younger voters could spell trouble for the GOP as generational replacement occurs (yes, that’s a euphemism). However, one aspect of this trend is anything but rosy for Democrats: Since the first national exit poll was taken for a midterm election in 1978, only once (in that first survey) has the 18-to-29 age group made up a larger portion of a midterm electorate than voters who were 60 or older. And not only have young people almost always been the smallest part of midterm electorates in this period, their participation has usually been much smaller compared to presidential years. With Democrats more reliant on young voters to win elections, drop-off among that group could make it harder for Democrats to find success in midterm cycles. Why is increased reliance on younger voters a potentially fraught strategy? 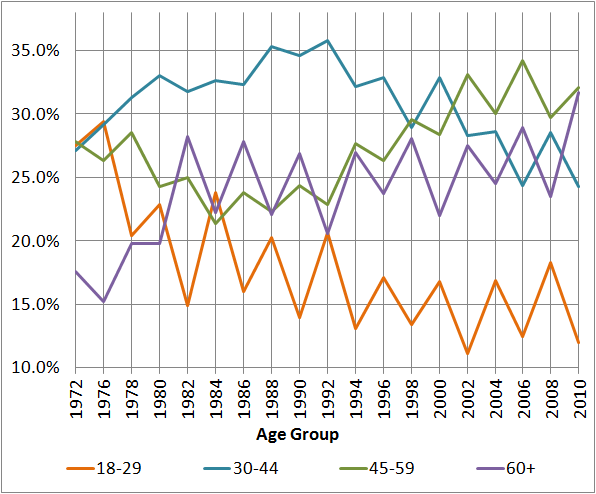 First, consider recent voting habits by age group. 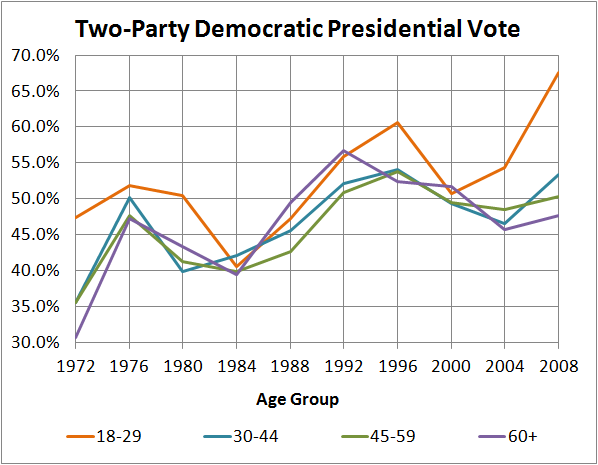 As shown below in Figure 1, in the Age of Obama, the older the voter, the more likely that voter is to vote Republican; the younger the voter, the more likely that voter is to vote Democratic. This age pattern continued in 2010, when in House races Republicans won 59% of voters 65 or older, 53% of 45-to-64 year olds, 50% of 30-to-44 year olds and just 42% of those under 30. Looking back, the positive correlation streak between increased age and increased Republican voting started in the 2006 midterm cycle, at least when the electorate is grouped into four age cohorts. Prior to 2006, this trend did not necessarily hold true. For instance, in the 2004 presidential election, more 45-to-59 year olds supported Democrat John Kerry than did 30-to-44 year olds. 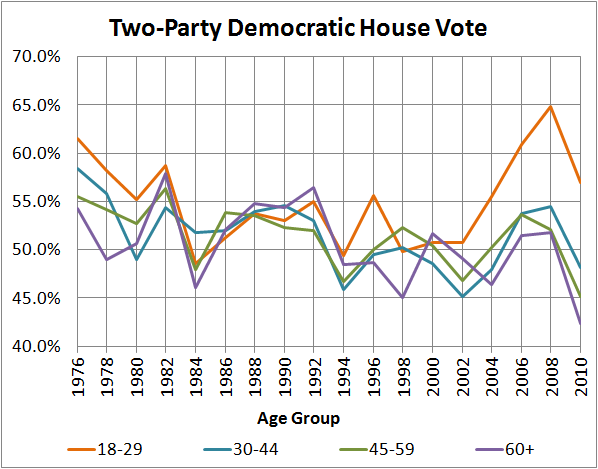 In fact, looking back in time, there has been some variation in the order of age group-level support for the two major parties in both presidential and congressional elections. As shown in Figures 2 and 3 below, while the youngest voters have typically been more Democratic in their leanings, they have not been the most Democratic age group in every election since 1972. Note: Because published 2012 exit poll data grouped ages 18-29, 30-44, 45-64 and 65 or older, complete 2012 data is unavailable for the same age groupings as presented above. The raw data from the 2012 exit poll hasn’t yet been made available for researchers to potentially overcome this issue. Although the pattern hasn’t always held true that older voters will vote more Republican, it doesn’t appear to be a trend that’s going away in the near future. The country is increasingly polarized, partially because of the large gap in policy and political preferences between white and nonwhite voters. Nonwhite voters overwhelmingly support Democrats and most of their policy positions — Obama won over 80% of the nonwhite vote in 2012 — while white voters tend to back Republicans and more of their policy positions — Romney won 59% of the white vote in 2012. For the time being, this political generation gap spells trouble for Democrats in midterm elections. 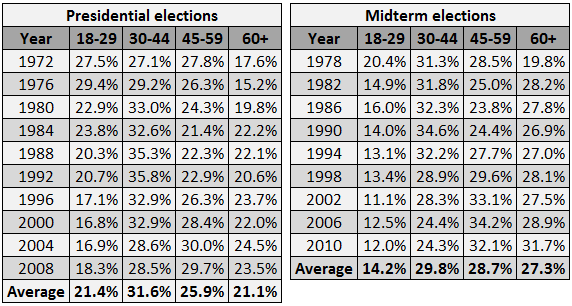 Look at Tables 1 and 2 below: On average, the youngest cohort of voters made up just over one-fifth of presidential electorates from 1972 to 2008, but only about 14% of midterm electorates. Younger voters have consistently shown up in smaller numbers in midterm cycles. Not once have 18-29s made up a larger portion of the electorate in a midterm election than they did in the prior or subsequent presidential election since midterm exit polling began in 1978. Given the time period under examination, it’s unsurprising that younger voters have been turning out in smaller numbers than older voters, especially in recent years. The population is getting older — the nation’s median age rose from 28.1 in 1970 to 32.9 in 1990 to 37.2 in 2010 — so, naturally, older voters make up a greater share of the electorate. Still, sharply lower young voter participation in midterm elections is surely a trend that predates national exit polls. Older people are simply more likely to vote in general due to a number of lifestyle factors, such as buying a house, starting a family and becoming settled in a community. Even when the 18-to-29 cohort made up a plurality (30.4%) of the country’s adult population in 1980 (the last time that was true as the Baby Boomers got older), the 1982 midterm election saw an eight-point drop in that group’s portion of the electorate from the 1980 presidential election, falling from 22.9% to 14.9%. 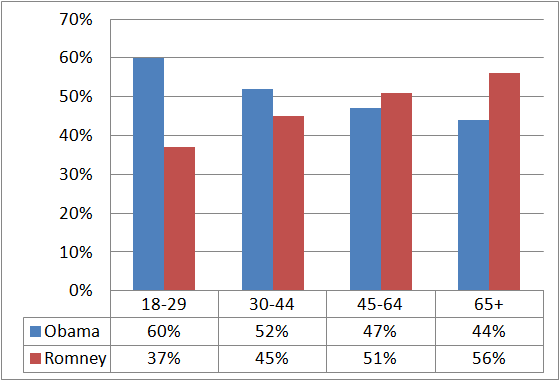 Corresponding to the serious drop-off among younger voters is the increased influence of older voters in midterm electorates. While the number of voters drops precipitously from presidential to midterm elections among all age groups, older voters see a smaller drop-off relative to younger ones. Take a look at Figure 4 below, which presents the data in Tables 1 and 2 in a visual format. The glaringly obvious trend in Figure 4 is the inverse relationship between the 18-to-29 and 60+ cohorts. Every presidential election, the size of the 18-to-29 portion of the electorate increases sharply while the 60+ portion of the electorate decreases markedly. Every midterm election, the opposite happens because elderly voters are more likely to cast votes in both presidential and midterm years than their younger counterparts. It’s also worth noting the movement of the Baby Boomer generation through the different age groups. As a large majority or entirety of the 18-to-29 cohort in the electorates between 1972 through 1984, the Baby Boomers explain to some degree why there was higher participation by younger voters as a proportion of the electorate. In the meantime, the older Boomers entered the 30-to-44 age range, causing it to increase as well. That cohort spiked in participation in 1992, when Boomers made up 100% of it. From there, the 45-to-59 group increased in size as the Boomers aged further. While one of the two certainties in life — death (the other being taxes) — will always to some degree restrict the size of the oldest voting group, improved health care and longer lifespans mean that more elderly voters will be around to make their voices heard in the future. And because of the Baby Boomers, we can expect there to be a lot of elderly voters: 10,000 people will turn 65 every day between now and 2030, according to Taylor’s aforementioned The Next America. If recent voting trends continue, a majority of these individuals may well vote Republican in upcoming elections. As older people are more likely to vote, these voters will continue to have outsized influence in midterm contests where young voters are less likely to turn out on Election Day, to the potential benefit of Republicans in our present political environment. This midterm drop-off among young voters is a serious problem for Democrats. While Obama’s reelection in 2012 proved that Democrats can make up ground with strong support from the youngest voting cohort, the party could not turn those supporters out in 2010 and probably won’t be able to in 2014 either, given the historical pattern. That said, Democrats can obviously still do well in midterm years: For instance, a 2006-style electoral atmosphere, in which a deeply unpopular Republican president dragged his party down in a sixth-year midterm, will almost always work out in Democrats’ favor, no matter the demographics. But in a neutral midterm environment, and particularly a poor one like 2010, Democrats’ reliance on younger voters could hinder their efforts to win seats in the U.S. Senate, U.S. House, many state legislatures and the vast majority of governorships that are chosen in midterm cycles. While get-out-the-vote strategists might think otherwise, the only practical solution to this problem for Democrats may be Father Time: Like all those who have aged before them, as Millennials get older they will become more consistent voters. Democrats will just have to hope that they remain as strongly Democratic in their voting habits as they have proven to be over the last few years, somewhat like members of the Greatest Generation (born before 1928), who came of age during the New Deal and remained more reliable Democratic voters than their younger counterparts even into their twilight years.